Can you remember the last time you were extremely excited? Euphoric? I don’t mean moderately happy or contented. I mean really, truly, genuinely thrilled. Can’t remember it? Me neither. The search for joy, passion, excitement or exuberance doesn’t often result in a good find. Contentment is a more likely result of the search. Not that contentment is a bad result, but it’s not quite up to the level of joy, passion, excitement or exuberance. Kay Redfield Jamison wrote a terrific book that was published in 2004, Exuberance: The Passion For Life. She’s a John Hopkins Professor of Psychiatry so she knows what she’s talking about. She dives into the science, physiology and other aspects of the great feeling of exuberance. She confesses that most in her profession focus on the darker, more dreadful feelings of human experience. That alone makes the book noteworthy. But it is a quite serious look at what should be among our most coveted emotions. Who among us doesn’t want to be thrilled and filled with passion? Maybe it’s being in love. Maybe it’s the kind of thrill skydivers crave. Or it could be that fast heart beat that comes during a tense scene in Saw III. As you can tell, there are many different variations of passion, excitement and exuberance. Some are mere passing moments while others, like being in love, are hopefully longer lived. Do these feelings become more scarce as you grow older? I only ask because kids sure seem to have more of it than old folks. Maybe life just has a way of beating the passion out of the most excitable among us. Maybe we taint kids with our own cynicism and gloominess. It’s likely a combination of all that. There’s something terribly sad about the fact that I can’t remember the last time I felt it. I’d love to lie to you and tell you that I feel it frequently, but I don’t. Exuberance eludes me. Passion is something others exhort us to find, but they don’t show us how. We’re told that where passions and profits meet is The Promised Land of Capitalism. I can see that, but what I can’t necessarily see is an easy way to find that intersection. In The Element, Sir Ken Robinson talks about the intersection between natural aptitude and passion…and how that changes everything! I believe him, but again – it’s often a difficult intersection to find. I don’t suspect it’s a busy enough intersection. 1. What can we do and lose all track of time? 2. What would we most enjoy doing without regard for pay? 3. What can we talk about for hours on end? 4. What do you think is your true purpose in life? 6. What would you try if you knew you couldn’t fail? Those are all wonderful suggestions – and exercises, but they all sort of remind me of that adage about battle plans being great things…until we meet the enemy. So it may go with these exercises. We can write insightful stuff perhaps, but then reality kicks in and we’ve got to deal with all the internal and external influences that can ruin our plans. Nope. Not a clue. I do know some people with clinical depression who stay in bed a lot, but it’s not something I’d encourage. Besides, I don’t think that fits the bill for exuberance anyway. 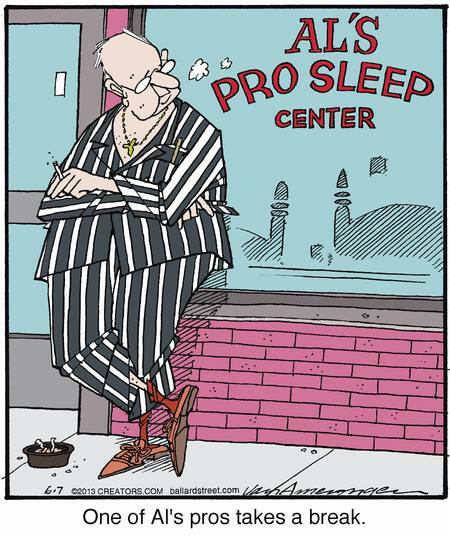 But Al’s Pro Sleep Center appears to hire some professionals. I read recently of the New York food critic who loved to eat, and so he became a restaurant critic in New York. The problem with that passion is limitation (and weight gain). It’s like NFL quarterbacks. There aren’t many of them so the opportunities are quite limited I suspect. But, you could give it a go as an independent food critic – maybe start your own blog and see how it goes. That might excite you. It doesn’t do much for me and I too, love to eat. Ideas. I suspect our ability to embrace a great idea is where we can all find some passion and excitement. Like an inventor who wakes up in the middle of the night with a “Eureka!” thought – we can all find it thrilling when we create a terrific idea. That may also explain why it’s been awhile since I last experienced exuberance. Too few good ideas. Maybe it’s because the practical realities of life have so beaten me down I can no longer easily see myself for what’s possible. Or even probable. Perhaps it’s because my brain has become mush with all the emails, blogs, Tweets, Facebook entries and other information that has clogged my creative synapses. Maybe I need some Drain-O for my creative plumbing. What would that be? Have you ever wondered what it must have been like during the days when America was young? When people off loaded the ships carting around all their possessions and embarking across the country to lay stake to a piece of land? How exciting must THAT have been? Something tells me exuberance gave way to survival after awhile though. But it certainly must have been exciting. I don’t want to experience excitement where I have to wonder if I can find some critter to kill so we can eat supper. That’s just not quite the thrill I’m looking for. So, I continue to learn. Now I know that exuberance must contain an element of fun. Killing critters wouldn’t be fun for me although I do know some fellow Texans who would find that very thrilling indeed. Happily, I’m seeing something in my children – now grown (my oldest is 34) – that I didn’t really see in my generation. I saw it when they were just children. I still see it in them today. And I’m hopeful that our classrooms are still seeing it, even at a higher level. All the way into high school. And college. It’s experience. Passion, excitement and exuberance stem from actions and experiences…not money! While you can purchase a ticket to a sporting event and experience a live game, that’s far too passive to really launch exuberance. Better to be on the field. Now you’re talking. My grown daughter still plays volleyball. My grown son still plays hockey. A big part of the experience for them is playing, not watching. The education community loves the word ENGAGE. Simply put, it means “we have the full attention of the students.” They’re into it. Whatever “it” is. The education community also loves the word IMMERSION. My daughter enrolled her two sons into a Spanish immersion program in elementary school. She’s a Texas certified Spanish teacher. No, it’s not her first language. The program is rare, even here in Texas. The program involves speaking only Spanish to the kids for grades 1 through 4 (I think). When my daughter was in college she took a trip to Mexico for the same reason – to immerse herself in the culture and the language. It helped her learn. She believes it will help her sons more easily become bi-lingual. My children have been far less interested in monetizing than my generation was. I think that’s a good thing. I think that may help them find more exuberance than I did. Many people of my generation fell into a career path that lasted their entire life. I was fortunate to fall into something early, but it was always about business. And the stuff of business. My natural gravitational pull is toward the people side of things, which is why the podcast was rebranded as HIGHER HUMAN PERFORMANCE. Our kids are people, too (even though sometimes they can behave like creatures from outer space). Exuberance doesn’t look the same for all of us. And it doesn’t always remain the same. Mine has changed through the years, even though people have always been at the heart of it all. Once I was an artist. A cartoonist. But I didn’t know any cartoonists. Who makes a living drawing cartoons? I knew the cartoons had creators. I just didn’t know who they were. Not personally. Once I was a writer. But I didn’t know any writers. None of my friends’ parents wrote for a living. I knew the books, magazines and newspapers had writers. I just didn’t know any of them. Not personally. Why should children put a price tag on exuberance? They shouldn’t. My generation had a price tag put on it. That’s why I was never encouraged to draw or write. “You can’t make a living doing that.” Sure enough. They were right. Because I believed them. Your children will one day bear the responsibility to earn a living. That’s the practical reality of life. But, I wonder why we don’t let them embrace and chase their dreams to do things outside the realm of what we consider practical. They’re kids. They don’t yet have bills to pay. Or families to support. Do you suppose that the passion, excitement and exuberance we foster in kids today might one day manifest itself into creativity they could turn into a livelihood? With the digital age we know many more things are possible today. Our kids are living in a world of better opportunities to pursue their exuberance. There they sit each day in our classrooms. There they are playing sports on the fields in our communities. There they are doing homework on your kitchen table. Future artists. Musicians. Writers. Scientists. Engineers. Salespeople. Videographers. Whatever they’re skilled enough to do, and whatever they’re driven to do. Show them the possibilities. Build up their dreams. Encourage them in the experiences. Teach them what took me a lifetime to learn – only because I forgot. Help them learn to embrace the feelings of exuberance that comes quite naturally to children. Their lives will be fuller, happier and more creative if you’ll guard their dreams until they’re mature enough to guard them on their own.